Love them or loathe them the 3-wheeler, Cycle-car or even Tri-car, has had an important impact in the development of the present day motor car. From the beginnings of the Industrial Revolution to the Concept cars of the future, these vehicles can hold their headlamps up with pride. They were present at the birth of motoring and possibly may well be the the answer to the future with the constant depletion of the Earth’s energy resources. The aim of this web site is to build an online catalogue of all 3 wheeled vehicles manufactured from the invention of Cugnot’s first steam powered 3-wheeler in 1769 to present day. 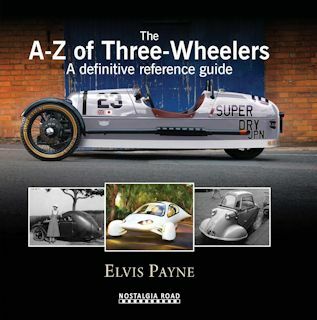 If you have a 3-wheeled vehicle that is not listed in any of these pages please let me know and I will add it. I hope that you enjoy your visit. 2019 sees the 19th year that this website has been running and as such a huge amount of data has been built up over the years as 3-wheelers, both websites and companies, come and go. Unfortunately due to writing books the website updates suffered from late 2015 - 2017 although the site is now back to being updated. Thank you all for your patience and constant visits to the site during this time. The A - Z listing of 3-wheelers detailed on this website currently displlayed as a list until a database can be recreated. Owning and maintaining your 3 wheeler is quite different than a standard automobile in some ways. Parts such as a correct windshield or original wheel can be difficult to locate even with the advent of the internet and social sharing sites. For this reason, I've listed some resources below for your consideration and further review. Before there were 4-wheelers there were 3. A brief time line of 3-wheelers from Leonardo da Vinci’s plans in 1478 to present day. 1. www.tireindustry.org - The Tire Industry Association. 2. www.tirekingdom.com home - Tires & routine maintenance info. What is the fastest 3-wheeler? What is the oldest, the smallest, the largest, the , the most expensive .... find out here the answer to these questions and more..
1. www.vintageglass.com - USA glass company specializing in classic car auto glass. 2. www.suntecautoglass.com - Phoenix, AZ company that can source vintage windshields/glass. As part of our 10th birthday,in 2010, 3-wheelers.com got in touch will a number of key people that it has met over the years to arrange a number of e-interviews. 1. www.eetc.org - Equipment and Engine Training Council. 2. www.technician.academy - Engine technician school & resource. Interview with Elio Motors by Arak Leatham. Symbols on the dashboard - What do they mean?